What do high-performing organizations focus on as opposed from low-performing organizations, and what differentiates how they do it? No surprise here – but what is interesting is the way in which high performing organizations (those whose net profit grew more than 5% over the last year) and low-performing organizations (those under 5% over the last year or shrank) approached this. The focus here is more on the systems and processes to drive results and create agility, rather than having the right customers and right people to drive both revenue and profit growth (as with high performers). So what does this mean? Greater growth and profitability is driven by people. Systems, process improvements, and cost reductions can contribute towards growth – the only problem is that there is only so many times that you can cut the lawn before it starts to die off. Conversely, focusing your attention on business and resources on the right customers and talent, rather than squandering it in a shotgun approach, enables you to grow the business with no limit on the upside. For this, you need to inspire trust. The key question then is this: are you trustworthy? More to the point do your customers and staff think you are trustworthy? What do you think you are – honestly? And how would you assess how trustworthy you are? Share your thoughts here. 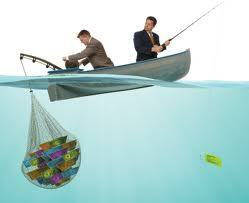 What do good anglers know which we can use in driving stronger business growth and results? Fishing is one of the most popular leisure time pursuits in the world. There is something about going out there, rod in hand, to capture that ever elusive fish. This takes time, patience, skill and – let’s be honest – a bit of luck. One thing that experienced anglers do is that they don’t waste time in an unproductive location. You can try a few casts, change the bait, but if the fish are not biting then it is time to move on to a new spot. We need to be like good anglers – if the fish do not bite quickly, then be prepared to move on and try elsewhere. You might try for the same fish in another location, or using different bait or lures, or even go after another type of fish. You want to be in a market where you will get a positive reaction as early as possible. Doing this will save you time, money and embarrassment – it will also allow you to learn from the experience, and to apply it in future fishing spots. What we do or how good we think something is not important. There is only one judge out there and that is the market, and the market only cares if what you’ve done meets its needs. I get a lot of answers – to hang a picture, for home improvements, to replace my old hand-drill etcetera. They are all wrong. Customers are not interested in the features of the drill – such as its colour, whether it is turbo-charged, the special safety grip it has etcetera – they are only interested in the outcome from using it. find and locate better fishing holes more quickly. What do you do to find the right fishing holes? How long do you wait before you move to a different location? Are you really focused on delivering the outcomes a customer needs or delivering the product or service itself? Share your ideas, insights and experience! Share the knowledge, share the wealth!